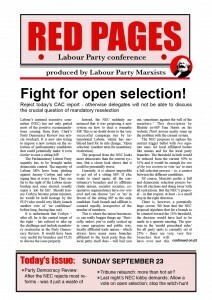 How delegates can support the fight for open selection! 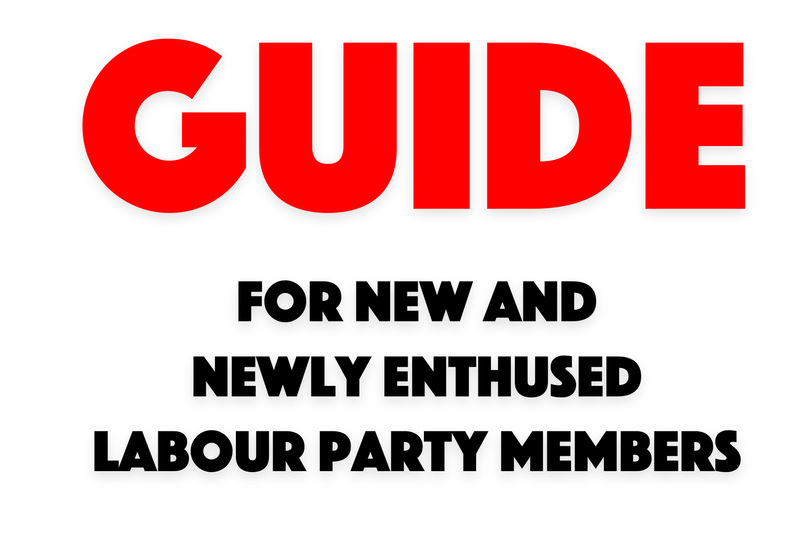 Labour’s national executive committee (NEC) has not only gutted most of the positive recommendations coming from Katy Clark’s Party Democracy Review (see article overleaf). It is now also trying to impose a new system on the selection of parliamentary candidates that could potentially make it even harderto oust a sitting MP. The Parliamentary Labour Party urgently has to be brought under democratic control. The majority of Labour MPs have been plotting against Jeremy Corbyn and sabotaging him at every turn. They are far to the right of the Labour membership and, once elected, usually enjoy a ‘job for life’. Should Jeremy Corbyn become prime minister, he would be held hostage by the PLP (who would very likely launch another vote of ‘no confidence’ before long, forcing him out). It is unfortunate that Corbyn – after all, he is the central target of the right – has refused to take up the challenge and include mandatory reselection in the Party Democracy Review. It would have been very useful for branches and CLPs to discuss the issue properly. Instead, the NEC suddenly announced that it was proposing a new system on how to elect a wannabe MP. This is no doubt down to the very successful campaign run by International Labour, which has mobilised hard for its rule change, ‘Open selection’ (another term for mandatory reselection). The proposal from the NEC looks more democratic than the current system. But a closer look shows that it could be potentially worse. Currently, it is almost impossible to get rid of a sitting MP: If s/he wants to stand again, all the constituency’s branches and its affiliates (trade unions, socialist societies, cooperative organisations) have one vote each and can choose ‘yes’ or ‘no’ in favour of the sitting MP as the only candidate. Each branch and affiliate is counted equally, irrespective of the number of members. This is where the union bureaucracy can really bugger things up: “Basically, unless you’ve really cocked up in some egregious and public way, locally affiliated trade unions – which always have many more branches affiliated to the local party than the local party itself does – will bail you out, sometimes against the will of the members.” This description by Blairite ex-MP Tom Harris on his website Third Avenue neatly sums up the problem with the current system. The NEC proposes to replace the current trigger ballot with twoseparate ones: for local affiliated bodies like unions and for the local party branches. The threshold in both would be reduced from the current 50% to 33% and it would be enough forone of the two sections to vote ‘no’ to start a full selection process – ie, a contest between the different candidates. Of course, Marxists prefer a full and democratic selection process before all elections and doing away with all restrictions. But the NEC’s proposal – in that respect, at least – is a small step in the right direction. There is, however, a potentially huge caveat: We hear that the NEC proposal stipulates that for a branch to be counted toward the 33% threshold, the decision would have had to be made in a quorate meeting. The quorum in the ‘model procedural rules’ for all party units is currently set at 25% – there are very, very few branches that will have ever met this quorum. Most branches have agreed lower quorums with the regional office; others don’t bother ‘counting’. But if the NEC’s proposal really stipulates that 25% of the local membership must have been involved in this trigger ballot, then they will become even more impossible than under the current system. Then we come to the second step: the actual voting. And here the NEC’s proposal would lead to a worseningof the current situation. At the moment, after a successful trigger ballot, the voting between candidates takes place in CLPs only (affiliated organisations and unions have no vote in this stage). As we understand it, the NEC wants to change this to a so-called ‘one member, one vote’ (Omov) system. We write ‘so-called’, because Omov is nothing new in democratic organisations: everybody who shows up to a meeting gets a vote, right? Not according to a narrative that is becoming ever more dominant though, because this traditional method ‘disenfranchises’ all those who don’t come to meetings. What is meant by Omov nowadays is that all local members get a vote, perhaps via an online or postal ballot. This sounds democratic, but on closer inspection it clearly favours the sitting MP. They would not just have the ‘recognition’ factor and the newspaper columns: they also have the money and the staff to write to all those members who don’t normally go to meetings. 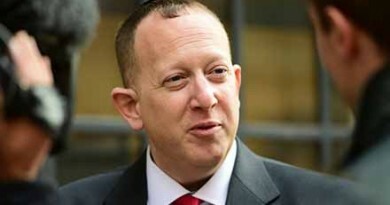 The upstart who is trying to challenge the MP can of course send out their CV and election statement. But where they can really convince members is face to face, in branch and CLP meetings. Even better if a debate could be arranged between the candidates, where members can ask questions and make up their minds. Such a debate would be impossible to organise online. We therefore urge all delegates to vote against the NEC’s proposal – and support the excellent rule change tabled by International Labour instead: in order to achieve that, the conference arrangement committee has to be successfully challenged tomorrow. IL’s rule change would do away with the trigger ballot altogether, giving all candidates a level playing field. There would be no need to challenge the sitting MP, as there would alwaysbe a full selection process. This amendment would automatically fall if delegates vote for the NEC recommendation. Mandatory reselection would once again establish a very important democratic principle in the party – and allow us to get rid of the saboteurs. Although Momentum owner Jon Lansman used to be an important figure in the Campaign for Labour Party Democracy, whose main claim to fame remains the successful fight for mandatory reselection in the Labour Party in 1980 (it was abolished again in 1989 by Neil Kinnock), he abandoned the principle at the very moment Jeremy Corbyn was elected leader. A big mistake, given that the PLP, dominated by the right, was never going to give Corbyn an easy ride. So, instead of doing away with the undemocratic trigger ballot altogether, Jon Lansman drew up lame proposals to raise the threshold from Tony Blair’s 50% back to Neil Kinnock’s 66% – ie, two thirds of local branches and affiliates would have to vote in favour of the sitting MP, otherwise a full selection process would begin. Lansman even had this proposal sanctioned by the membership in one of Momentum’s tortuous and clearly biased online “consultations”. But he seems to have undergone a welcome change of heart. Last week, he sent an email to the membership, informing them that Momentum now favours a system that gives “a fair chance to all candidates and does away with this negative, divisive stage of campaigning – so it’s an open contest from the start, and there are no ‘jobs for life’. That way, local members and the sitting MP can compete for the Labour Party’s backing at the general election, and run positive campaigns about local issues voters really care about.” Momentum has even set up a petition on the issue and is strongly urging its members to lobby the NEC. He might have done so for his own reasons (which are too complex and peculiar to deal with here) but a change of heart in the right direction is always welcome. 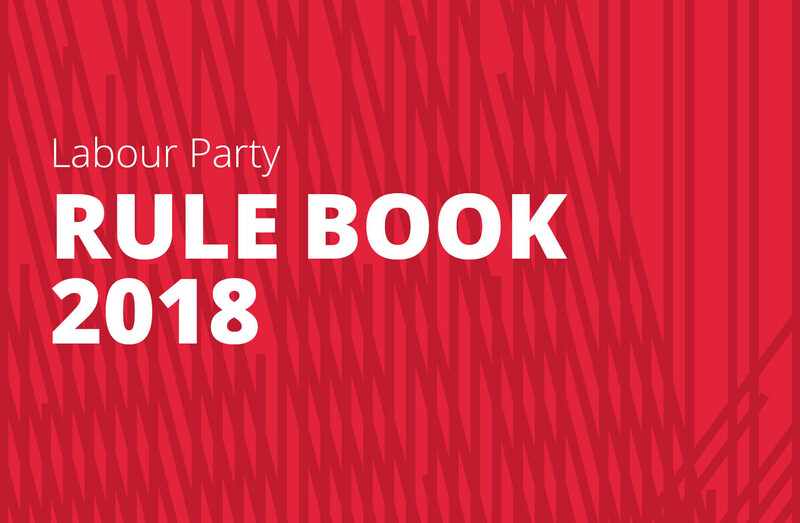 Our party – and its constitution – are ripe for radical reform: Throughout the history of the Labour Party various leaders have shaped and reshaped things according to their requirements … and the wider balance of class forces. Today CLPs are only allowed to submit either one contemporary motion or one constitutional amendment per year, which means that any attempt from below to force through changes can take an incredibly long time. And, once conference has formally voted on an issue, it cannot be revisited for another three years – even if it only deals with the same question tangentially. The result is a ridiculously overcomplicated travesty of democracy. Yes, the Party Democracy Review (PDR) would, if agreed, result in a number of changes. But clearly, the constitution needs more than tinkering. Indeed it would be no bad thing if the whole thing was swept away and replaced by something fit for purpose. A special conference could be called for such an initiative. We were never that hopeful that the PDR would represent a big step forward – after all, Jeremy Corbyn and his allies would have to consciously take on the right in a civil war that ends in the decisive victory for the left, for democracy, for those who support socialism and oppose capitalism – and that is not happening so far. Instead there is retreat, conciliation and a constant turning of the other cheek. Even the very limited reforms proposed by Katy Clark were hit on the head by a majority of the NEC. Very few positive proposals remain. For example, Pete Willsman’s report of the September 18 NEC meeting notes that the ridiculous restriction of “contemporary” will be scrapped. This is excellent, as CLPs have had to scramble around for studies or news reports in order to submit a political motion to conference. Another potentially worthwhile proposal concerns how the leader should be elected. The NEC will move a rule change that would require any candidate to have the support of 10% of individual party members, plus 5% of MPs/MEPs and of union affiliates. Currently, any candidate needs the active support of 10% of MPs or MEPs – the other groups play no role. The Guardianhas described this proposal as a “purge of the Chrises” – Williamson and Leslie, leftwing and rightwing troublemakers respectively. However, as a matter of fact, it should make it in theory slightly easier for a leftwinger to get on the ballot, as 10% of the members should be easier to convince than 10% of MPs. But if one considers that the incumbent NEC was only voted in by 9% of the membership, we understand why some describe this proposal as worse than the status quo. * that there should be a realistic quorum for larger CLPs, where the current 25% would be unmanageable. The NEC also accepted a few recommendations in Katy Clark’s report that we strongly oppose. For example, all CLPs are to transfer to an all-members-meeting structure, doing away with the general committees, which consist of delegates from branches – both party branches and local affiliates (unions, socialist societies and the Cooperative Party). In general, Marxists prefer the delegate system, because it gives more consistency to proceedings. Delegates feel more obliged to show up and are more likely to be able to take informed decisions. 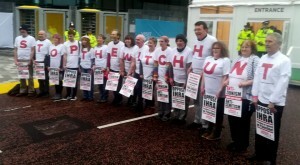 The bigger the CLP and the more members show up, the more unwieldy it becomes. Key decisions would no doubt be outsourced to the executive or some other bodies. If this is combined, as suggested, with more ‘digital democracy’, we fear the further depoliticisation and disengagement of party members: why bother coming to a CLP meeting that doesn’t make any key decisions, when you can just sit at home and click a few buttons? We also oppose the NEC’s apparently uncontested decision to increase the size of the National Constitutional Committee (NCC), which takes up all disciplinary cases that the NEC feels it cannot deal with. Instead of 11 members, this body will now have 25. Adding 14 members might indeed “speed things up”, but this does not mean that the proceedings will become any more just or fair. For example, the NEC recommends that, “where the possible sanction falls short of expulsion from the party, the NCC could make a decision without a hearing”. Surely, anybody accused should have the right to defend themselves – especially when it comes to highly politicised accusations of anti-Semitism, for example. The NCC is currently dominated by the right and has been expelling members on the most ludicrous grounds. No, its sole purpose is to conflate criticism of Zionism and Israel with anti-Semitism. No wonder then that we hear of new, post-IHRA suspensions on the grounds of members using the word ‘Zionist’ and calling Israel ‘racist’. But clearly racism is exactly what Israel has depended on from its origins – and has now enshrined with its ‘Nation State’ law. Leaving aside the regrettable role “the unions” seem to have played, we have criticisms of the process as a whole. Despite its official name of ‘Party Democracy Review’, it has been far from democratic. Of course, there will have been hundreds, if not thousands, of contributions from members, branches and CLPs. But it is entirely up to those running the review to decide which contributions are ‘accepted’. We would venture to suggest that much of the final document will have been agreed well in advance of the ‘consultation’. A draft of Clark’s proposals was presented to the NEC on September 18 – ie, four days before conference. 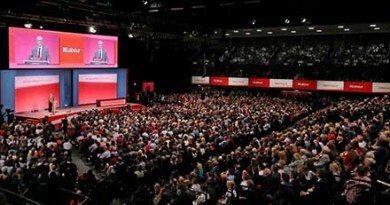 Amendments from the NEC then had to be incorporated before the document was presented to yet another NEC meeting on September 22, before delegates could see it for first time – on the day they are due to vote on it. As everyone knows, it is impossible for delegates to make amendments. Clearly this is not the way to go about democratising our party. After a gap of some years the left magazine Tri- bune was relaunched at a well-attended and enthusiastic rally at The World Transformed last night. Introducing a panel which included David Harvey, Dawn Foster, Owen Jones and Grace Blakeley, the journal’s editor, Ronan Burten- shaw, argued that there was a clear need for a magazine which reflected both the experience of the contemporary Labour movement as well as drawing on the “enduring relevance of our his- torical achievements”. Tradition was a key theme for Burtenshaw and he very deliberately identified his magazine with what he saw as the illustrious history of the Tribunite current and the Labour left since the 1930s.The first edition certainly had some simi- larities with the ‘original’ magazine with articles covering current politics, history, culture, the arts and ideas. But both in form and content this ‘Tri- bune’ is much closer to the US left publicationThe Jacobin which is not surprising given that Bhaskar Sukara, publisher of The Jacobin, is also now the publisher of the Tribune. The suc- cess of The Jacobin and the hopes for the new/ old Tribune rest on the new layers who have been drawn into activity by the Sanders’ campaign in the US and the election of Jeremy Corbyn as Labour leader in Britain. 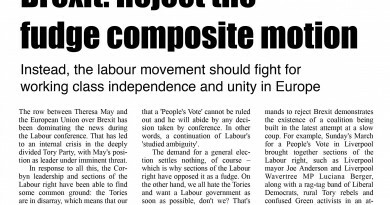 Labour movement is to be welcomed: after all, the range and size of our movement’s media is pitifully inadequate for the political tasks facing us. We need more magazines and papers: we need more voices and much more debate within our ranks. But can this Tribune make such a useful contribution to those discussions? We can but hope. However, given that the magazine proudly lays claim to both the discredited historical tradi- tions of Labour left reformism and its contempo- rary manifestation in the inchoate politics of Owen Jones, this seems somewhat doubtful. So far Labour Party Marxists comrades have been well received by delegates and visitors to conference and to The World Transformed event. 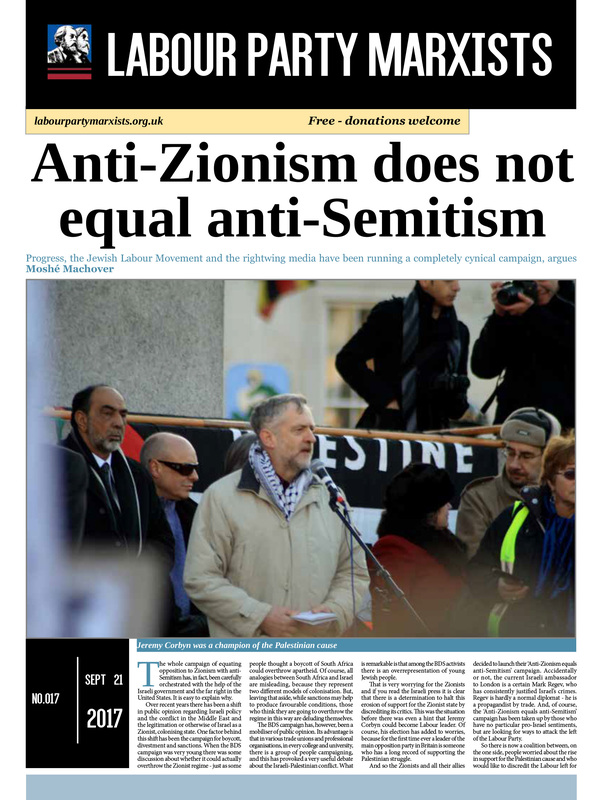 Nobody has yet reported any hostility to the latest edition of LPM, which features the headline, ‘Why Israel is a racist state’. 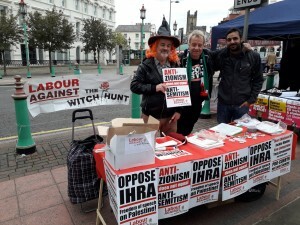 But this is unsurprising, since a large majority of Labour activists strongly support Palestin- ian national rights and are opposed to Zion- ism. They know that such politics have noth- ing whatsoever to do with ‘anti-Semitism’, as the right likes to pretend. Equally positive has been the attitude to those from Labour Against the Witchhunt and Open Selection. Both were involved in yester- day’s attempted lobby of the NEC meeting. I say ‘attempted’, because the police dispersed the 40-50 participants on the grounds that the meeting was taking place on “private land” adjacent to the conference centre. April 5, 2019 Comments Off on Where are our trigger ballots?